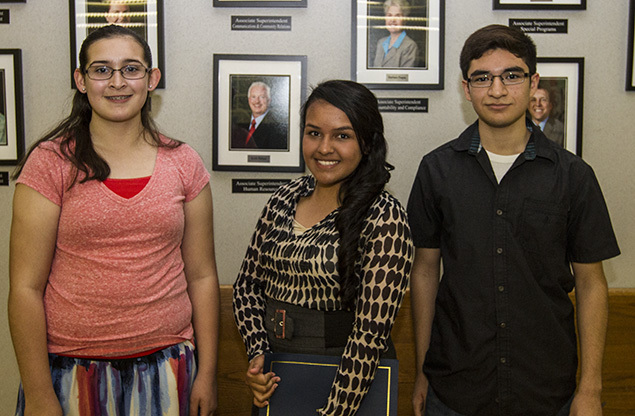 Pasadena ISD recognized the 2014 Vanguard Community Service Award honorees. The awards are given annually to the top five seniors at each high school campus. Students are selected by the campus administration, based on guidelines that require at least 300 hours of community service done outside of school activities. 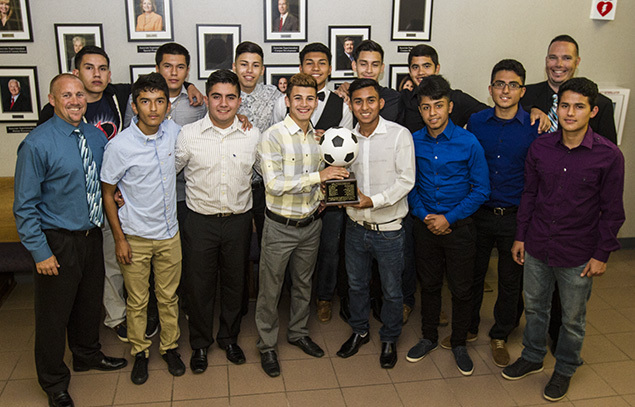 For the first time in Rayburn High School history, the boys soccer team won the 22-5A district soccer championship. The team had a 10-0-4 district record and an overall record of 13-3-6. The Texans are led by longtime head Coach Bijan Timjani and assistants Sean Larson and Edward Garcia. This was Memorial's first district championship in boys’ soccer in the history of the school. The Mavericks finished 10-4-4 in district play and 14-3-7 overall. The Mavericks are led by head coach Scott MacNeish and assistants Mark Turner and Kyle Jurek. The eagles began the year by winning the Pasadena Cup and went on to finish 3rd in District 22-5A with a 10-3-1 record. The eagles took off from that point and won playoff games against, PA Memorial, Clear Lake, Pasadena Memorial, and Cy Springs before falling to Fort Bend Clements. This year’s run was a record setting year as this was the furthest that the eagles have gone in the playoffs. The eagles finished 17-4-3 overall this year. The eagles are led by head coach Gavin Bruce and assistants Joe Down and Jeff Hersh. The Bayou City Art Festival sponsors an art contest for middle school students in Houston area school districts. The top 30 entries were exhibited in a local gallery, at the Bayou City Art Festival and displayed online for the viewer’s choice awards to choose the Top 3 winners. Those winners were all claimed by Pasadena ISD and represent two of our intermediate school programs. Each student will receive a gift certificate for an art supplies, and one week class at the MFAH Glassell Junior School. For each winning student their respective campus will receive a $500 gift certificate for art supplies to supplement their programs. The Houston Livestock Show and Rodeo School Art Program had more than 300,000 art students from 52 districts in the greater-Houston area enter their artwork for judging at the district level. Last year’s record was shattered this year with a new record of 21 Pasadena ISD student artists advancing from the district showcasing their work at this year’s Houston Livestock Show and Rodeo. Along with the Best of Show and Gold Medal Awards at each grade level, a record-breaking 14 Special Merit Awards were earned by Pasadena students. Scholastic Art and Writing Awards is the longest running and most prestigious recognition program and the nation’s largest source of scholarships for creative teens in the U.S. The artwork is judged regionally and depending on the medal received advances on to the national level for judging and potential recognition. Pasadena ISD had a number of students that received awards at the regional level.